Devonport's prison was located at Pennycomequick, opposite to where the Royal Mail buildings are currently located. 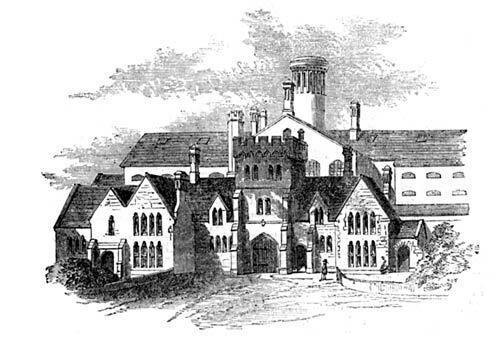 Both the image and following text are from an article in The Illustrated London News 21 February 1857, with the heading of... the Devonport Borough Prison. The subject of Prison Discipline is now occupying so large a share of public attention that an illustration of the system adopted in the new Prison at Devonport, cannot fail to be interesting to all who have studied this momentous subject. This prison is calculated to receive seventy prisoner, and was erected abut six years since, from the designs and under the superintendence of Mr. J. P. St. Aubyn, architect. It is situated at the extremity of the borough of Devonport, near the south Devon railway, on a site of rather more than three acres. The style of architecture adopted is that of the fourteenth century. The officers’ houses are placed together in th4e south front, and designed in the domestic character of that period; while the entrance to the prison is in the centre of this range of buildings, under a tow capped with bold machicolated battlements. The prison buildings within the walls are quite plain. The materials used are Bath stone for the dressings of the doors and windows, with the hammer-dressed limestone of the neighbourhood for the walls. The works are completed at the total cost of £13,135 3s. 7d. ; being at the rate of £187 13s. per cell. The prison is provided with a chapel, necessary offices, and warming apparatus; and was planned to afford accommodation for 120 additional prisoners in case it should become necessary to take advantage of the capabilities of the plan for such extension. The discipline maintained in the prison is the separate system for the promotion of which that portion of the building occupied by prisoners, as well as the laundry, hard-labour pumps, and airing ground, have been laid out. The round tower seen in the back of the design is a shaft for ventilating the building. The view, by Mr. R.J. Hallam, is taken from the south, and shows the entrance to the prison with the adjoining officers’ residences. The builders were Messrs. Hoskyn and Co. of Devonport. Steve Johnson provides a good photo of the prison on his CyberHeritage website; the link is one third down the page.